(Sidney Janis Gallery, New York); sold 18 November 1959 to Mr. and Mrs. Ira Haupt, New York; by inheritance 1963 to Enid Annenberg [Mrs. Ira] Haupt, New York; gift 1977 to NGA. Founders and Heirs of the New York School, Museum of Contemporary Art, Tokyo; The Miyagi Museum of Art, Sendai; The Museum of Modern Art, Ibaraki, 1997, no. 7, repro. 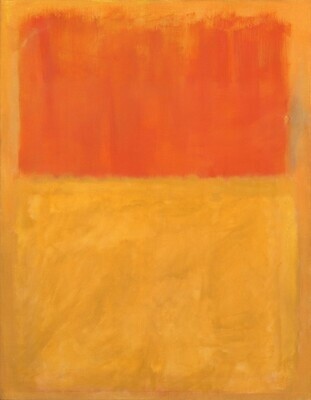 Mark Rothko, 'A consummated experience between picture and onlooker', Fundació Joan Miró, Barcelona; Fondation Beyeler, Basel, 2000-2001, no. 25, repro. Pollock to Pop: America's Brush with Dalí, Salvador Dalí Museum, St. Petersburg, Florida, 2005-2006, unnumbered catalogue, repro. Ils on regardé Matisse, Musée Matisse, Le Cateau-Cambrésis, 2009, no. 12, repro. American Paintings: An Illustrated Catalogue. National Gallery of Art, Washington, 1980: 216, repro. Wilmerding, John. American Masterpieces from the National Gallery of Art. National Gallery of Art, Washington, D.C., 1980: 19, no. 62, color repro. Williams, William James. A Heritage of American Paintings from the National Gallery of Art. New York, 1981: color repro. 8, 247. Walker, John. National Gallery of Art, Washington. Rev. ed. New York, 1984: 616, no. 953, color repro. Wilmerding, John. American Masterpieces from the National Gallery of Art. Rev. ed. National Gallery of Art, Washington, D.C., 1988: 190, no. 72, color repro. Grunenberg, Christoph. Mark Rothko. Washington, D.C., 1991: 14-16, fig. 13. Craven, Wayne. American Art: History and Culture. New York, 1994: 560-561, color fig. 36.18. Richler, Martha. National Gallery of Art, Washington: A World of Art. London, 1997: 197, color fig. 12. Anfam, David. Mark Rothko: The Works on Canvas: Catalogue Raisonné. New Haven and London, 1998: no. 501, repro.